1. Purpose and scope: The production of aluminum liquid by hydrogen removal, on-line filtration, removal of impurities and hydrogen inside the aluminum liquid, to ensure that the quality of the flat ingot meets the requirements. 3, the use of tools: small slag box, slag shovel, ceramic filter plate, graphite rotor, plugging and so on. 5.1 Prepare all kinds of tools and check whether the pressure values of various gases are normal and whether the pipeline system leaks. 5.2 Check that the graphite rotor is in good condition and the ceramic filter plate is placed correctly. 5.3 Check if the baffle is in good condition. If it is damaged and replace it in time, place the baffle in the flow cell according to the production heat. 5.4 Check the deaeration tank hydraulic system and check if the lifting system is normal. 5.5 Preheat all kinds of tools and flow tanks and slag tanks, and confirm that the slag tanks are properly placed. 5.6 Confirm the temperature of the aluminum liquid and the heater temperature meets the requirements. 6.1 Control the holding furnace to tip over, so that the aluminum water in the flow tank smoothly flows into the dehydrogenation furnace, and at the same time, the asbestos wool at the aluminum outlet of the deaeration tank is opened. 6.2 Adjust the N2 or Ar pressure to 0.6Mpa, and the flow rate of each rotor is 4m3/h. 6.3 Open the chlorine control valve, adjust the pressure to 0.3 Mpa, and the flow rate is 0.04 m3/h, so that Cl2 can smoothly enter the main airflow. 6.4 During the casting, the use of the heater is determined according to the temperature of the aluminum liquid in the degassing tank. 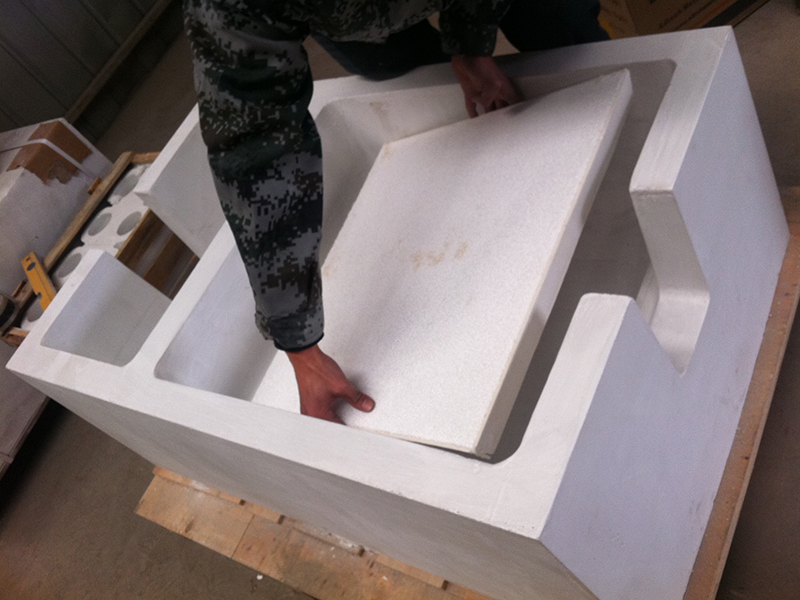 6.5 After the aluminum liquid is cast, the aluminum outlet of the deaeration tank is blocked with asbestos, the middle baffle is opened, and the launder is cleaned at the same time. 6.6 Close the chlorine valve and use Ar during the holding period to adjust the flow rate to 1m3/h per rotor. 6.7 Confirm that the heater in the degassing box is working properly during the heat preservation period. 6.8 If it is necessary to replace the graphite rotor or replace the alloy or stop the furnace, it is necessary to carry out aluminum and slag removal operations. 6.8.1 Close the various gas valves, stop the graphite rotor from rotating, and turn off the heater. 6.8.2 Lift the single rotor degassing box lid with electric hoist and rotate 900 while cleaning the graphite rotor and the aluminum slag on the heater. 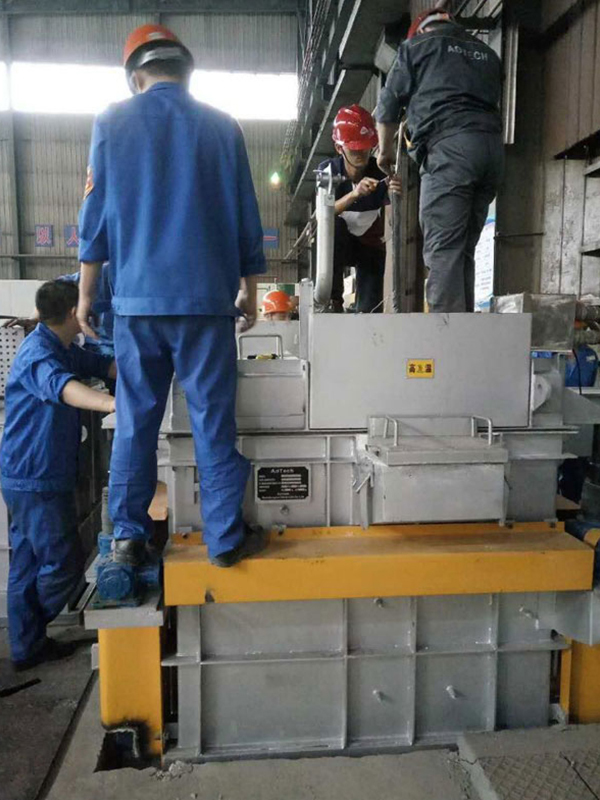 6.8.3 Open the Evans degassing box and put the aluminum port, start the hydraulic cylinder, tilt the box, and pour the aluminum liquid into the slag tank. 6.8.4 Clean the aluminum slag in the tank with a slag cleaning tool. 6.8.5 Start the hydraulic cylinder, reset the cabinet, cover the furnace cover, and inflate the inflatable gasket on the tank. 6.8.6 Put a plug on the plug to block the aluminum outlet and close the locking device. 7.1 When the aluminum water reaches the preset ceramic filter plate filling height, the probe on the baffle sends a signal to raise the baffle so that the aluminum water flows stably into the ceramic filter plate, and at the same time open the asbestos at the outlet of the aluminum liquid filter box. velvet. 7.2 Confirm that the temperature of the aluminum liquid and the heater are working properly. 7.3 After the casting is finished, lower the pneumatic baffle and block the outlet of the aluminum liquid filter tank chute with the chute gate, and confirm that the heater works normally and keep the temperature of the aluminum liquid. 7.5 If you want to stop the furnace or replace the ceramic filter plate or replace the alloy, you need to carry out aluminum and slag removal operations. 7.5.1 Turn off the heater and lift the top cover of the filter box. 7.5.2 Clean the damaged ceramic filter plate. 7.5.3 Open the aluminum outlet of the substrate in the aluminum liquid filter box, release the aluminum liquid, and clean the aluminum residue in the cabinet. 7.5.4 Put a plug of aluminum silicate on the plug to block the aluminum lining of the filter box and close the locking device. 7.5.5 Place two ceramic filter plates in the box and cover the top cover. The heater was turned on and warmed up 30 minutes before production. 8.1 During the insulation period, ensure that the deaerator and ceramic filter heaters are working properly. 8.2 Inspect the chlorine gas flow and pressure and dispose of it in time. 8.4 Before opening the chlorine, any moisture must be removed to limit the corrosion of the pipes and instruments. 8.5 Any seal, once removed, must be replaced. 8.6 Under no circumstances should the air circuit be operated under pressure.